In May of 2009 I gave up reviewing long-past meetings of the Representative Assembly (RA) of the Confederation of Democratic Simulators (CDS). The five instalments of the CDS Chronicles reviewed the RA meetings from 3 August 2008 to 9 November 2008. But it soon became clear that the account was falling further and further behind instead of catching up to the present. And the fifth instalment was followed with silence. Now another nine months later I still want to cover the missing period somehow. A possible approach would be to cover each RA as briefly as possible, at the risk of leaving out much that is important. So let us travel back in time to the point where we left off: the RA meeting of 23 November 2008. The main business at this meeting was Jamie Palisades' Chancellor's report. The amended Commerce Bill had requested the Chancellor to pay a Second Life business consultant to develop a promotional plan for commercial activities within CDS. However, the candidates interviewed by Jamie were disappointing, and the effect on Second Life spending of the real-life economic downturn made such an investment seem rather futile. The Commerce Bill also provided that at least 15% of all unowned commercial plots in CDS be offered to CDS citizens with a 50% reduction in rent, in order to stimulate new business development. But very few such plots were available, although Jamie expected several appropriate commercial plots to become free in the near future. Jamie also noted that the "yellow map" direct sale feature adopted by CDS failed to give an overview of the prices and availability of land, which discouraged buyers. Moreover the yellow patches everywhere made CDS look half-empty. Another problem was that CDS outlaws subtenants, in order to ensure that land-owners are voting citizens - although people get around this by joining groups that hold land in the name of the group. Justice Soothsayer asked Jamie how the land questions impact on the newly-introduced idea of merging CDS with Al Andalus. Jamie replied that he expected to have soon a rent analysis from Al Andalus showing financial feasibility of the merger. 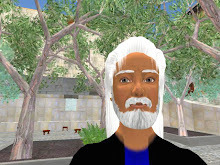 Arria Perreault asked what it means to stimulate economic activity in Second Life, saying that it is more a question of teaching citizens how to create things, than of drawing new tenants. Gwyneth Llewelyn asked how renters could be made to abide by CDS law, and suggested that renters might be allowed in provisionally, with the expectation that they would become citizens after a certain time. Gwyneth Llewelyn proposed a motion to introduce the "LRA pro tempore" (an RA member designated to replace the Leader of the Representative Assembly automatically in case of absence) as a Constitutional change. The motion passed. The election of someone to fill the new position was postponed to the next meeting. Moon Adamant reported from the New Guild. Jamie asked if there was a committee to review the General Master Plan (GMP). Moon replied that if a decision was taken about territorial expansion a committee could be set in motion. Arria mentioned that the RA had asked for calculations relating to land fees, and was worried about missing the possibility of buying a void sim at the current price. Jamie brought up draft legislation concerning land sales (the yellow map) and land reclamation (method of foreclosing and taking back land when rent is not paid). Gwyneth approved the strong measures of the Land Sales Reclamation Act, but Arria objected to the concept of "provisional citizen," observing that people don't lose the right to vote because they don't pay their taxes. No decision was taken. Jamie then discussed the budget, proposing investment in a new land management system instead of paying a commercial development consultant. He would need to see proposals to evaluate the price and features of the software, which should also generate an automatic list of all landowners. The next item was the Land Sales Reclamation Act. After addition of an amendment specifying that the CDS government would post a method whereby absent landlords could prepay rent, this bill was passed. Then the RA considered the Land Sales Listing Improvement Act, which would take the yellow map markers off of land that was up for sale. After discussion of alternatives, such as a "central listing method" and bulletin boards at the two main hubs, the motion carried. The RA meeting of 4 January 2009 was the last one of that semester. It was followed by the bi-annual RA elections. The candidate list was published on 5 January, and a candidate's debate was held on 11 January. The polls were open from 10 January to 17 January, and the Election results were announced on 18 January 2009. The Simplicity Party won 3 seats, to be filled by Symo Kurka, Soro Dagostino and an additional person to be named. The Citizen's Social Democratic Faction (CSDF) won 2 seats, to be filled by Gwyneth Llewelyn and Justice Soothsayer, and the Democratic Pragmatist Union (DPU) won 2 seats, to be filled by Sonja Strom and Pip Torok. This seems a convenient point to end the present post. The next "Fast Forward" will begin with the first meeting of the new RA on 1 February 2009.